At the beginning of the year, I pick a verse that I want to purposely focus on living out. Last year I chose Philippians 2:3 and learned how selfish I really am. I want to be right and noticed, even in the areas I didn’t realize were an issure. In my own personal conviction, I got rid of Facebook so not to have avenues that focus on bragging about myself and have tried to be quieter in my opinions that aren’t necessary — “tried” is the operative word. It has been eye-opening to see how simply letting go of my own desires and, in humility, serve others impacts my walk with God and the world around me. Believe me, I still have a long way to go! This year I chose Zephaniah 3:17, which says, “The Lord your God is among you, a warrior who saves.He will rejoice over you with gladness.He will be quiet in his love. He will delight in you with singing” (CSB). For many, this can be a hard picture to imagine. On one hand, there is a mighty warrior who saves; yet on the other, this mighty warrior rejoices in us, is quiet in His love, and delights in us. For me, it’s not too hard to think of God as being mighty, but not very often do I think of God cradling me in His arms like a big Daddy and singing a lullaby over me as He delights in my presence. God, this mighty Warrior, leans in close and whispers His love song to me. When I fully grasp the magnitude of this picture, I want nothing more than to be the treasure that God adores and to be obedient to Him. Jason, my husband, treats me as his treasure. I can tangibly see his love for me and physically hear him as he speaks his love over me. I don’t want to take advantage of how he treats me, and I want nothing more than to be that gift. It’s the same in my relationship with God, but I have to trust in the truth of those words when He feels distant and when storms rise around me. He is close as He fights my battles. There are many things in our lives that can seem out of our control, and raising support can be one of them. Everything in life seems to hinge on finances. We need money for shelter, food and comfort. From my own experience, I’ve seen that financial problems can be one of the greatest strains on faith. We wonder if God really cares when we quit our job to pursue ministry, and then we face not having money to buy food or don’t know where we’re going to live. Where is God in the midst of this? Western philosophy tells us that we’re a success when we get a good education and a good job, so we can live in a big house and have all the toys we want. We’ve indoctrinated some of that same philosophy into our churches and families. So when God takes everything from us in order for us to depend solely on Him, we can begin to think that something is wrong. We’re weak because we can’t provide the right things for our family. We’re beggars, because we have to rely on others to serve us. It’s humbling because it goes against every teaching of society, and sadly, even many Christians don’t get it. However, Zephaniah 3:17 gives us the beautiful picture of God who wants us to curl up in His arms to hear His quiet voice while He fights for us. We don’t have to fear. He’s among us, fighting for us. That’s the focus we must have in a chaotic world that’s against us. When we fully trust that picture of God’s character, we can face the struggles and trials with new hope. The economics of eternity shatters society’s mirage of stability. God’s got it. What areas in your life seem out of control? What difference does it make knowing that God is fighting for you? Does it change your attitude when you think of God as a mighty warrior who rejoices over you, is quiet in His love and delights in you with singing? A good picture of God’s providence in the Bible—out of many!—is when the entire Israelite army, including its best fighting men, marched up from Gilgal to help the Gibeonites fight against the Amorites. God promised Joshua that He had given this army into his hands, and not one of them would be able to withstand him. As the Israelite army attacked, a huge hailstorm came and more men died from the hailstones than from the sword. God fought for them. If someone takes this from a weatherman’s perspective, they could argue that the storm was coming anyway, and it just so happened that it started hailing while the fight was happening. The interesting thing is that the Miriam-Webster definition of providence is when something occurs by or as if by an intervention. As believers, we can see God’s hand and understand how He intervenes for us and works everything out for His glory and purposes (Rms. 8:28). Praise God that He does that for us! Unfortunately, I’ve seen many who are on the support-raising journey misunderstand God’s providence, so to speak. If we look at Joshua’s example, he had the calling to go and the promise of God. He obeyed, and most importantly, he took action. I’ve found many who are on the support-raising journey that hear the call, put their faith in the promise of God, and take that step of obedience; yet there is no action whatsoever. They sit and wait and wait and wait for the money to come. Their excuse is that it’s not right to ask for money. They don’t tell anyone God’s story, and they wonder why God doesn’t move. God has specifically put people on the support-raising journey in order for the entire body of Christ to be a part of missions. We have a story to tell. We need to actively brag about what God is doing here and around the world, to give God the opportunity to show up in big ways. He’s ready to move and is fighting for us. It doesn’t have to be through a huge hailstorm, but it can be through an unexpected gift or even through a personal God-encounter. We have no idea what God has in store for us on this journey, but we do know that He’s in control. How have you seen God at work on the support-raising journey so far? What actions do you need to obedient to do on this journey? One of the weapons Satan uses against Christians is illusions. He gives us the illusion that love is better with someone else, so marriages fail. He gives us the illusion that materialism is what we need, so stuff becomes our idols. His slight of hand can so closely mimic the truth that we don’t see it coming, hence why we are fooled. In this particular Psalm, the poet leads off with a foundational truths that prepare for the coming storms. He explains that God is our refuge and strength before the earth gives way and the mountains crash into the sea. He tells us of a great city of God, where the most Holy dwells before he tells of the wars between people and kingdoms falling. He commands us to be still so that we can understand this truth, because in the end, nothing else matters. God is above everything and the only One who is exalted. Notice how the psalmist doesn’t say if the mountains fall into the sea or if there are wars, then God is our refuge. The fact is that the world is going to be stormy and rough. Because of this, Satan wants to give the illusion that God has left us to battle everything alone. When we feel unshielded and naked, that’s when terror grips us, and we can become angry with God for leaving us all alone during the worst of times. God never promised the support-raising journey to be easy. There are enough storms around to try to distract us from God’s truth, even before we take a huge step of faith. In a literary sense, there are times when life actually feels as though entire mountains are crashing into the seas around us. Satan wants us to feel as though God has abandoned us, that God doesn’t understand that we are fighting for the needs of our family. These are illusions. Praise God that the psalmist knew that we needed to understand that God is our refuge and strength. He knew we would be walking through disasters and wars. But through it all, we can be at peace, because God is in total control. What storms are you going through right now? List them out and give them to God. Write out Psalm 41 by using your own imagery of what is happening around you. Explain how you see God before, during and after the turmoil. When was the last time you stopped everything you were doing and actually took a complete rest? Our souls need to be refreshed on the support-raising journey, but this is a hard thing to do. There are deadlines to work toward, people to meet, and letters to send. You do all of that, and then repeat it—sometimes even more frantically. The very first line of Psalm 23 says, “The Lord is my shepherd, I lack nothing.” How intuitive of God to lead with that statement. He knows that we have to be reminded of the fact that He is our good Shepherd who takes care of our every need. It’s only when we grasp this reality that we can settle down and rest. He’s saying, “I’ve got it! Put your mind at ease and rest. I’m your Shepherd who will protect you.” If you think you’re lacking in anything, then your mind will never shut off, as you think about how you’re going provide for what is lacking. Unfortunately, the support-raising journey can make us feel as though we’re lacking a lot. Not enough people are giving to us. How can we support our families? Are we going to be able to buy the things we need? I’m running out of people with which to talk. That person just rejected me. What am I going to do? The list goes on. The world tells us that we need certain things to be happy, and we need to live at certain income levels in order to be respected—people have even said this of ministry workers! However, that kind of worldly living is warned against in the Bible. Panic can set in when we aren’t able to achieve the worldly standards that have been demanded of us. When we’re worried about the things we’re lacking, that makes it hard for us to find rest for our souls. The good news is that our Shepherd knows what we need. We are without want. He asks us to trust Him, because we are going to walk through some difficult times and our souls will need to be refreshed along the way. He is preparing us for the dark valleys where His rod and staff will always be there to comfort us. On the support-raising journey, take time for your soul. It needs the rest. Your Shepherd tells you this. 1.Find a time on a regular basis to refresh your soul. 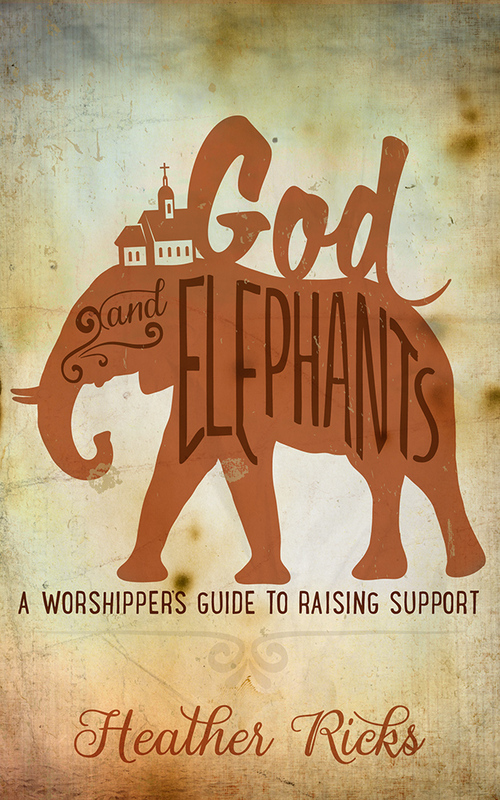 2.List the worldly ideas and concepts that have crept into your support-raising journey, and give them to God. 3.Trust that He is taking care of your needs. The only way to walk through a desert is with an endless supply of water. That way, when you see mirages glimmering in the distance, they don’t falsely tempt you to crawl to them for relief. And when you see vultures circling above, you’re not consumed with worry that you’ll be their next meal. Water becomes your lifeline. Apart from it, you can be led astray, or worse yet, die. Connected to it, water fills and satisfies, and allows you to enter dangerous territories without fear. As believers we have that same gift of Living Water through the Holy Spirit. Jesus declared in John 7:38, “The one who believes in me, as the Scripture has said, will have streams of living water flow deep within him.” The crazy thing is that, even as believers, we sometimes don’t tap into this truth. We enter deserts with tall glasses of water at our fingertips, yet we don’t drink. Sometimes I think the reason for this is that we don’t fully understand the true satisfaction the Holy Spirit will bring us. We are looking for something different, something else that will satisfy us in a different way. Water is tasteless, so we want more. The support-raising journey is not necessarily a desert. It is simply a journey on which God asks us to sacrifice everything in order to trust solely on Him. It has unfathomable benefits of walking hand-and-hand with God as He, like a happy Daddy, delights in directing His kids’ every step. The drawbacks come when we become dissatisfied with where He is leading us. The journey truly can become difficult and frustrating. We can be tempted by mirages of materialism or not being satisfied with how things are going. We can even want to give up when Satan circles around us to whisper to our hearts about how our circumstances are awful, and that a good Daddy would ask His children to sacrifice everything for Him. It’s in these moments we must recognize the truth Jesus spoke and drink from the Living Water of satisfaction in Him, no matter the circumstance. He knows what will grow us closer to Him and what will make the biggest impact for His glory. We must trust in that and stay attached to the Source. Are you satisfied where God has you? Why or why not? What will help you to draw even deeper satisfaction in Him? To equip those on the support-raising journey to encounter God and invite others into His redemptive work through the art of Christ-centered storytelling.